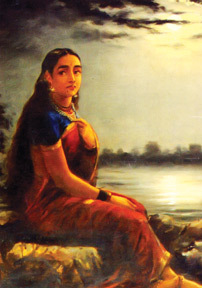 Art connoisseurs believe that Raja Ravi Varma is the most celebrated painter of modern India. He was born in 1848 and died in 1906. He dazzled the art world long enough to trap in his modern outlook while retaing the very essence of traditional identity of India's people that goes into his art that is the vogue among all art lovers of present. The Veena Player, oil on canvas Ravi Sharma. He is without any doubt, the soul of India; her brilliance that radiates around the world. 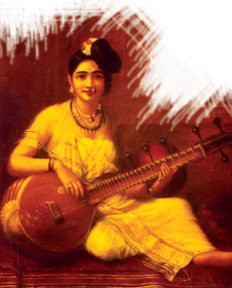 Rabindranath Tagore said ‘I have spent entire mornings scrutinising Ravi Varma's paintings. I like them very much indeed. These paintings show how much our country's typical human figures, themes and expressions are dear to us ... More over to paint a picture, the minutest details in convincing vividness, is not a trifling matter.’ Other critics acclaimed his greatness, theme, originality and sanctity in his paintings. Born into royalty from a family linked to the ruling house north of Trivandrum in Kerala, he still survives even after a century in Indian art and also as an artist representing the Europeanised school of Indian artist. Popular and visibly religious, the changing perceptions had little or no impact on his art. He is held in high esteem in the art collectors’ even today. When Varma was barely 13 he came under the wing of the palace artist at Trivandrum where he also learnt Dutch art that was available for him to study if he opted. In the years that followed Varma experimented with unbecoming and crude colour combinations and different techniques despite his credible efforts as to the nature of material available that later enabled him to hang many of his paintings in the Travancore Palace. With the influence of the West, Varma could acquire new paint material he had never seen or used before. His technique became very professional with the simple methods he applied. His canvas produced such a perfect blend of European Academic realism and the Indian spirit soared. His will to conquer sustained his Indian dream. His marriage to another royal member zoomed his status that brough him with direct contact with the British residents who persuaded him to participate in the Fine Arts Exhibition at Madras in 1873. As a result not only did he win the first prize but also the Governor's Gold Medal. It granted him an audience with the Governor, Lord Hobart who congratulated and advised him to keep his chosen art to bring honour his country. In the same year he won an international prize in Vienna. Varma's reputation reached every nook and corner of India. Ravi Varma had arrived as a colossus. He received the first prize at the Madras Fine Arts Exhibition. The Maharaha of Travancore presented the prize winning exhibit along with two others to the Prince of Wales, later King Edward VII who was deeply moved by the character of India found in them. There was no stopping to his greatness found in Indian art that he so much revered especially such as Nala Damayanthi and the episodes from the Mahabharatha. He went on to paint such classics such as Radha and Madhava, sleeping beauty, Lakshmi and Saraswathie and the glorious Brindavan and Krishna in it. These and many more are exhibited at the Baroda Museum and Palace. Varma who was quite wealthy around this time came into financial disaster due to political turmoil. Within a few years of his starting the press, it had to be closed down because the region being hit by the plague epidemic. Varma found it hard to battle out the monetary losses that began to rise. He sold the Press for Rs. 25,000 at that time and paid all debts contracted with scope it. He caught up with the lost years and surfaced again. This time Bombay was his second place where he had a wider scope to experiment with. He was deeply impressed with the elaborate costumes of the Maharastrian women that dazzled and mirrored powerful glitz that he caught on the canvas. Even the men shone in their colourful kurtas and tops. He engaged the nine-yard saree to wrap his heroine in splendour and gossamers effect around those svelt figures that stood out immortal like those of mythological goddesses especially on his favourite nymph, Sairandhri. But he was aware that all his heroines were mortals inspite of human idealisation and made sure they were placed in human situations. Otherwise how would he Indianise all his characters that went into the masterpieces. But men, he painted with superior felicity that are obvious in his studies. Varma who made drawings with charcoal on the walls and floors, shifting to European colours with brushes that were not available then, made his colours from flowers, leaves and the bark of trees. He had an uncle, Raja Raja Varma who initiated and encouraged him into the mysteries of painting, overlooked his young art. He being an artist himself discovered the inherent genius displayed by his nephew-artist without any formal training. And he lived to see his genius radiate around the world. Varma was a workaholic who rose at four in the morning every day. After a bath and performing his elaborate religious rituals, he began painting at first light. He laboured long hours and often got up at night to sketch his dreams. His diabetes worsened, with high fever and in bed, no medical wonder could have saved him even with two high profile physicians flown from Bombay, he passed away peacefully on October 2, 1906. Reuters had set up camp in this little obscure village to catch every glimpse of his last days.